I'm looking for a recommendation for a straightforward Disk/Sector editor for the Commodore 64 with a 1541 disk drive. 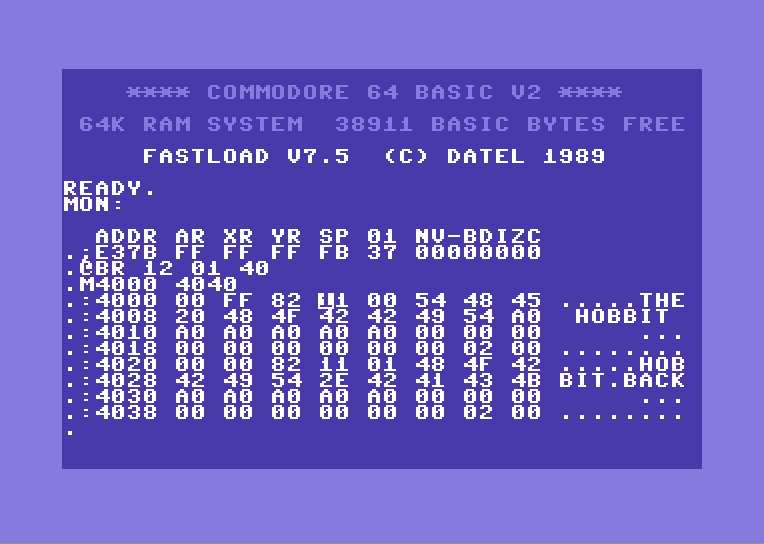 I've found some utilities for windows and other operating systems that will allow examination of D64 images but I'm looking for something running on the C64 itself. My goal is to use this inside VICE and on actual hardware to inspect both physical disks and some disk images I converted last year. I want to walk from the directory to the start of a given file, examine the leading bytes of the file (which should indicate the memory load address for the file contents) and walk the chain of blocks/sectors that comprise the file contents. I've gotten rusty with old age, and while I remember spending many long nights in front of Supermon64, I can't for the life of me remember what my go-to solution was for examining disks. As always, any input is greatly appreciated! 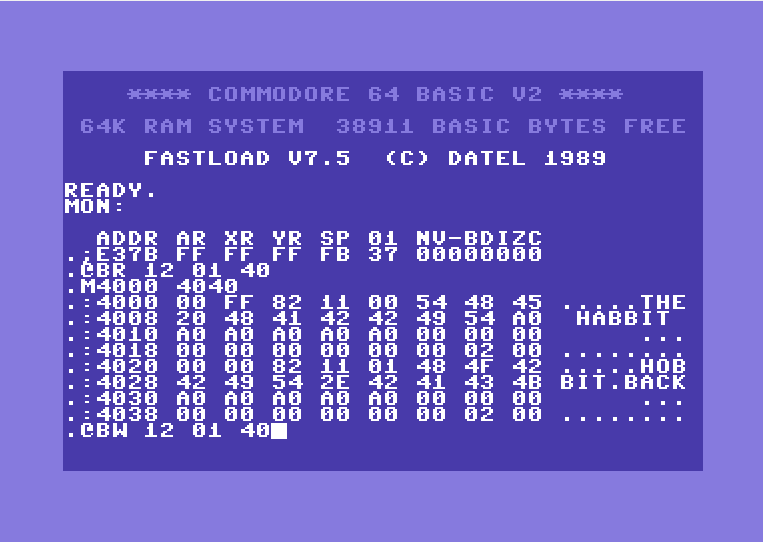 The Epyx Fast Load Cartridge did much more than just increase the speed of data between a 1541 disk drive and a Commodore 64. Features included a Machine Language Monitor and Disk Tools. 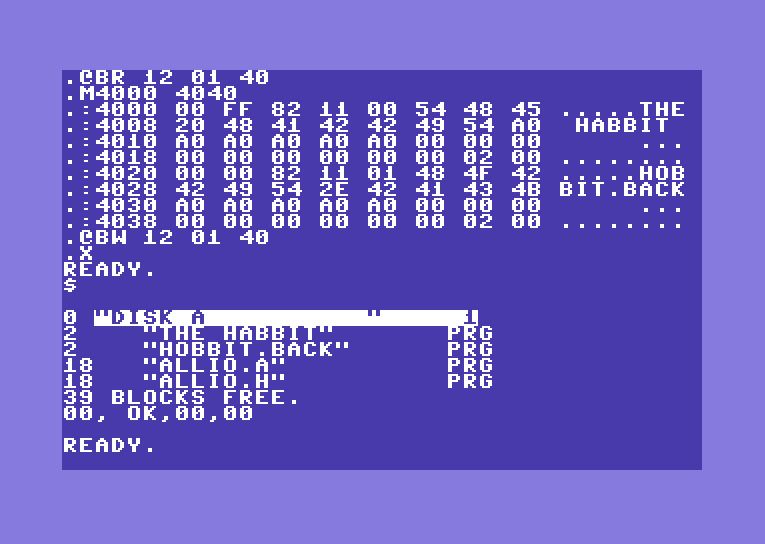 The Disk Editor may be a tool useful to you - I never used it since I was mainly interested in games, but the Fast Load cartridge is ubiquitous and commonly available. Not sure how to mount one in VICE. You can easily obtain a FastLoad manual with a cursory google search. 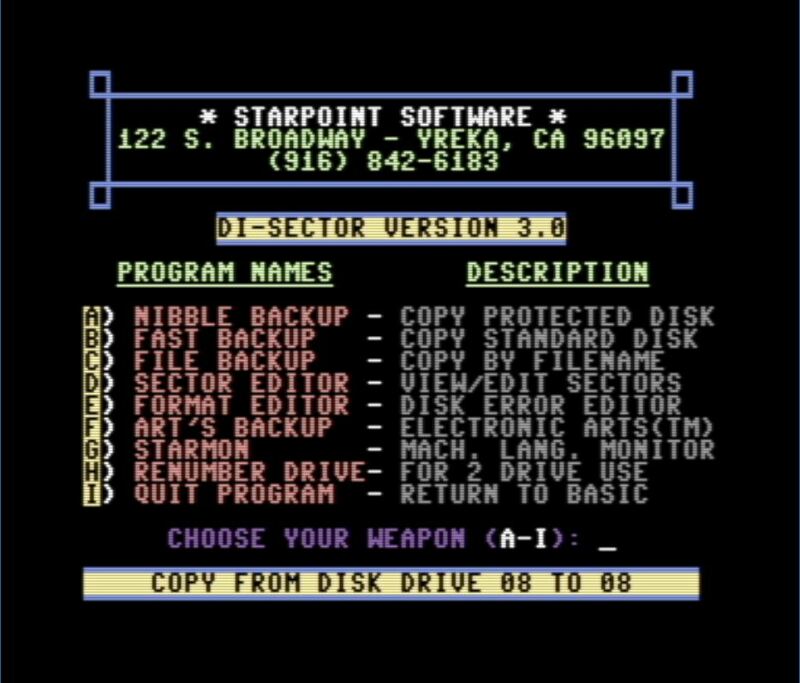 After doing some research, and some downloading, and some experimenting, I eventually settled on DI-SECTOR 3.0 from StarPoint Software (1985). What sold me on DI-SECTOR was the Text and Hexidecimal representations for the current sector are both on-screen at the same time. Many of the sector editors I looked at would only show the textual representation for the current sector and then only display the hex value for your current cursor position, which seemed overly cumbersome. I find the full display of both views to be far more friendly and closer to what I would expect from a modern hex editor. DI-SECTOR 3.0 was easy enough to navigate, and with a copy of Inside Commodore DOS it was simple enough to traverse the BAM, directory entries, file blocks, and do repair work to damaged data. Hopefully this helps someone else in the future! Enjoy! I can recommend Reconnaissance. 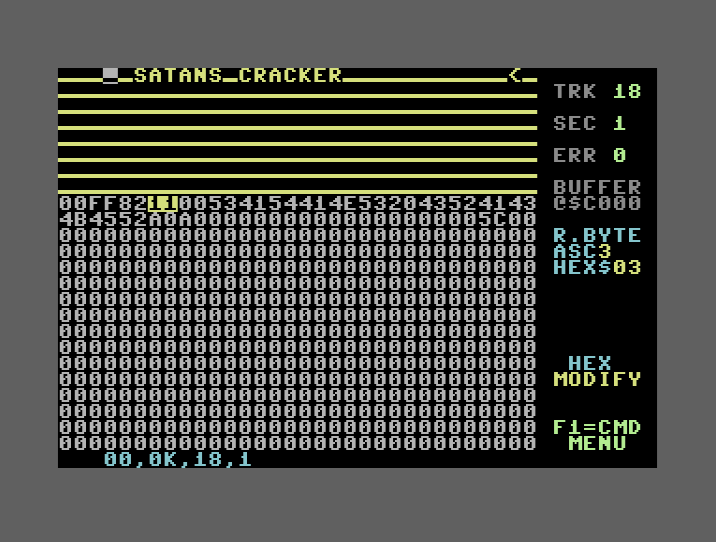 It's easy to use and also has a neatly arranged hex and ascii view. It is also what I used back in the days. ^ Only very few sector editors offer such wide petscii lines. This increases readability - each directory entry equals one line. The program "sector ed." starts at track $13, sector $00. The filetype is standard prg as defined with the $82 left of it. Just like you, I need a sector editor (my nordic power cartridge sometimes saves files with a wrong load-adress to disk). If you want small size the winner in my opinion is disc-doctor-V3 by kevin pickell using only 15 blocks. You maybe can find these programs if you g**gle for "commodore.software" and "disk editors", but I'm sure searching the internet for the program names will work, too. 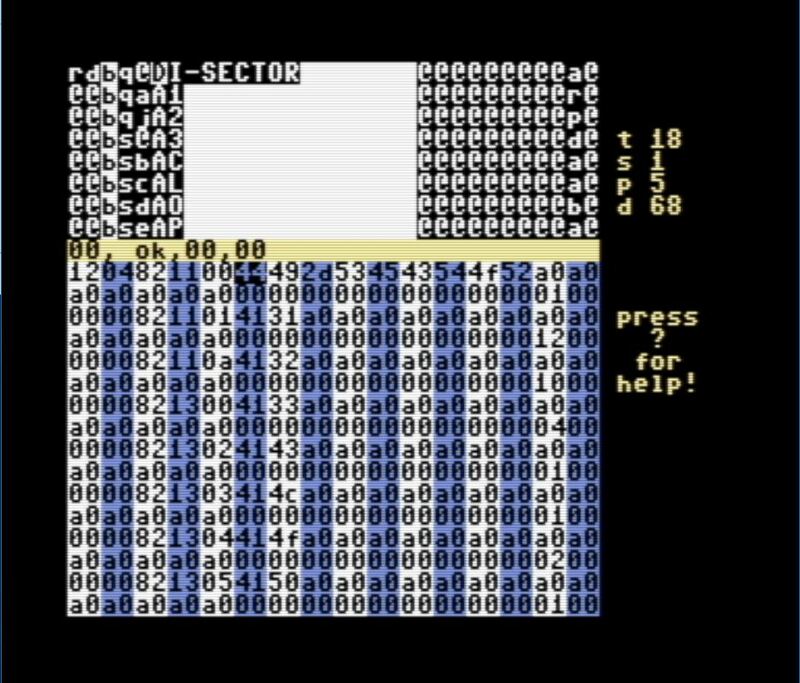 If you have a cartridge like the Nordic Power or the Action Cartridge+ you can use the sector editor that is built into the assembler monitor. It's less comfortable but way quicker and you don't have to load a program. 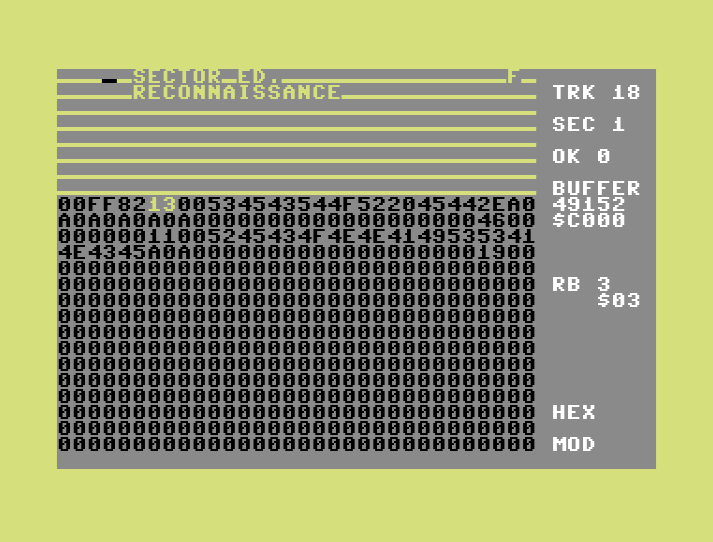 The monitor command "@BR track sector adress" will load a sector (256 bytes) to given memory adress. Like always "M 4000" or "I 4000" or "I* 4000" will let you view and edit the memory. If you changed something and want to write it back to disk just use "@BW track sector adress"
f.e. : "@BW 12 01 4000"
You can do exactly the same in Vice when you've got a .crt image file of the cartridge and mount it. Not the answer you're looking for? Browse other questions tagged commodore-64 floppy-disk or ask your own question.